I currently have an IOMega ix4-200d with 4 x 500GB Hard Disk Drives (HDD). I am in the process of rebuilding my vSAN Home lab to all flash. This means I’ll have plenty of spare 2TB HDDs. So why not repurpose them to upgrade my IOMega. Updating the HDDs in an IOMega is a pretty simple process. However, documenting and waiting are most of this battle. There are 2 different ways you can update your IOMega: 1 via Command Line and 2 via the Web client. From what I understand the command line version is far faster. However, I wanted to document the non-command line version as most of the blogs around this process were a bit sparse on the details. I started off by reading a few blog posts on the non-command line version of this upgrade. From there I came up with the basic steps and filled in the blanks as I went along. Below are the steps I took to update mine, your steps might vary. After documenting this process I can now see why most of the blogs were sparse on the details, there are a lot of steps and details to complete this task. So, be prepared as this process can be quite lengthy. After Reboot I noted all the disks are now healthy and part of the current 1.4TB parity set. This size is expected. First, you have to delete the shares before you can change the parity type. Go to Settings > Disks > “Click here for steps….” Then check box to authorize overwrite, choose OK.
After clicking apply my screen updated with a reconstruction of 0% and the display screen on the IOMega showed a progress bar too. Mine took more than 24+ hours to complete the rebuild. This entry was posted in EMC, ESXi, Home Lab, IOMega, SAN. There are two simple checks a virtual infrastructure (VI) admin should be doing to ensure ESXi Datastores and the Windows VM’s are properly aligned. If either are misaligned then performance issues will follow. Though I’m not going to get into the whys and how’s of alignment issues I will show you how to quickly check. By default if the VI admin formats the DS with vCenter Server or directly connected to a host via the VI Client the starting sector will be 2048. A starting sector of 2048 will satisfy nearly all of the storage vendors out there, however 2048 starting sector should be validated with your storage vendor. Here is a simple command to check your “Start Sector”. SSH or Direct console into a host that has DSs you want to check and run this command. Yellow, Green, and Blue – Are all VSAN Disks and all have a starting sector of 2048 << This is what I’m looking for, I want to make sure all DS disks start at 2048, if not they could experience performance issues. Windows checks are pretty easy too, the starting sector offset should be 2048. Note the screenshot below shows the Partition starting offset of 1,048,576, also note it’s in labeled in bytes not sectors. To find the starting sector just divide the Partition Starting Offset by the Bytes per Sector. Simple math tells us its right — 1048576/512 = 2048 Sector. 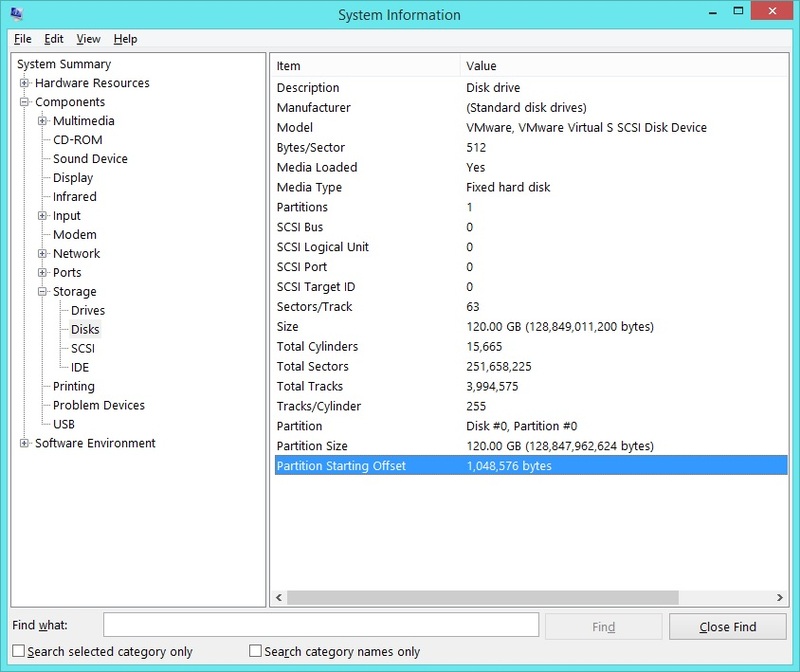 If your Partition Starting offset is anything other than 1,048,576 Bytes or 2048 Sectors then the VM is not aligned and will need adjusted. From a Command Prompt, type in ‘msinfo32.exe’ to bring up this screen, navigate as shown below, and note your Partition Starting Offset. This entry was posted in ESXi, freeNAS, Home Lab, SAN, vmware, VMworld, Windows, Windows Performance. VSAN Observer is a slick way to display diagnostic statics not only around how the VSAN is performing but how the VM’s are as well. Here are the commands I entered in my Home Lab to enable and disable the Observer. How to Start the collection…. [2014-09-17 03:40:26] INFO WEBrick::HTTPServer#start done. So what does it look like and what is the purpose of each screen… Note: By Default the ‘? What am I looking at’ is not displayed, I expanded this view to enhance the description of the screenshot. This entry was posted in ESXi, freeNAS, Home Lab, SAN, Test Lab, Virtual SAN, vmware, VMworld, VSAN. I recently did some exploring on my home lab around datastore heatbeats and came up with the following notes around how to determine which ones are active, how to change the defaults, and why vCenter Server might now choose a datastore. ■ The specified number of datastores is more than is required. vCenter Server chooses the optimal number of required datastores out of the stated user preference and ignores the rest. ■ A specified datastore is not optimal for host accessibility and storage backing redundancy. More specifically, the datastore might not be chosen if it is accessible to only a small set of hosts in the cluster. A datastore also might not be chosen if it is on the same LUN or the same NFS server as datastores that vCenter Server has already chosen. ■ A specified datastore is inaccessible because of storage failures, for example, storage array all paths down or permanent device loss. ■ If the cluster contains a network partition, or if a host is unreachable or isolated, the host continues to use the existing heartbeat datastores even if the user preferences change. Verify that all the hosts in the cluster are reachable and have the vSphere HA agent running. Also, ensure that the specified datastores are accessible to most, if not all, hosts in the cluster and that the datastores are on different LUNs or NFS servers. This entry was posted in ESXi, SAN, vmware, VMworld. Start in the FreeNAS admin webpage for your device. Choose Storage > Expand Volumes > Expand the volume you want to work with > Choose Create ZFS volume and fill out the Create Volume Pop up. Validate all Datastores still have Round Robin enabled. 2 Ways to do this. Summary – These steps worked like a charm for me, then again my environment is already setup, and hopefully these steps might be helpful to you. This entry was posted in ESX, ESXi, freeNAS, Home Lab, LIAN LI, SAN, Test Lab, vCenter Server, vmware. Recently I updated my home lab with a freeNAS server (post here). In this post, I will cover my iSCSI setup with freeNAS and ESXi 5.1. Keep this in mind when reading – This Post is about my home lab. My Home Lab is not a high-performance production environment, its intent is to allow me to test and validate virtualization software. Some of the choices I have made here you might question, but keep in mind I’ve made these choices because they fit my environment and its intent. The CIFS settings are simple. I followed the freeNAS guide and set up a CIFS share. Once you have your connectivity working, it’s time to setup round robin for path management. Browser Cache Issues — I had issues with freeNAS updating information on their web interface, even after reboots of the NAS and my PC. I moved to Firefox and all issues went away. I then cleared my cache in IE and these issues were gone. Jumbo Frames — Can I use Jumbo Frames with the SYBA Dual NICs SY-PEX24028? – Short Answer is NO I was unable to get them to work in ESXi 5.1. SYBA Tech support stated the MAX Jumbo frames for this card is 7168 and it supports Windows OS’s only. I could get ESXi to accept a 4096 frame size but nothing larger. However, when enabled none of the LUNS would connect, once I moved the frame size back to 1500 everything worked perfectly. I beat this up pretty hard, adjusting all types of ESXi, networking, and freeNAS settings but in the end, I decided the 7% boost that Jumbo frames offer wasn’t worth the time or effort. These settings will enable my 2 ESXi Hosts to balance their connections to my iSCSI LUNS hosted by freeNAS server without the use of freeNAS Networking Teaming or aggregation. By far it is the simplest way to setup and the out of the box performance works well. I hope you found this post useful and if you have further questions or comments feel free to post up or reach out to me. This entry was posted in ESX, ESXi, freeNAS, Home Lab, LIAN LI, Networking, SAN, vmware, Whitebox. I’ve decided to repurpose my IOMega IX4 and build out a freeNAS server for my ever growing home lab. In this blog post I’m not going to get in to the reasons why I choose freeNAS, trust me I ran through lot of open source NAS software, but rather on the actual hardware build of the NAS device. NIC – the SYBA Dual NIC I have used in both of my ESXi hosts, they run on the Realtek 8111e chipset and have served me well. The Mobo I choose has the same chipset and they should integrate well into my environment. RAM – 8GB of RAM, since I will have ~7TB of usable space with freeNAS, the general rule of thumb is to use 1GB of RAM per 1TB of storage, 8GB should be enough. Hard Disks – I choose the hard disks mainly on Price, speed, and size. These hard disks are NOT rated above RAID 1 however I believe they will serve my needs accordingly. If you looking for HIGH performance and duty cycle HD’s then go with an enterprise class SAS or SATA disk. Removal of the Wireless NIC…. Everything Mounted (Except for the SSD)….